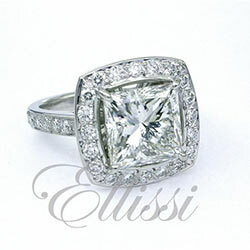 Home / Engagement rings: Custom Design / Round Diamond Rings / “Karlie” Diamond set split shoulder solitaire. “Karlie” Diamond set split shoulder solitaire. This is a split shoulder design with micro claw held diamonds, to the mid point. The central setting has additional diamonds grain set into the outer edge of the horseshoe style mount.